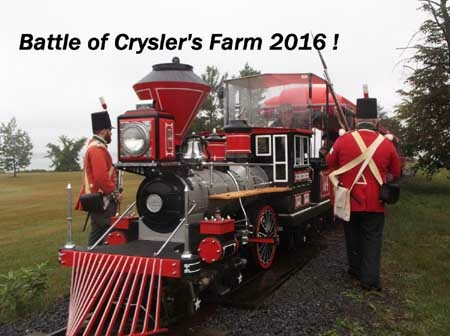 Despite the weather being a little damp, the Incorporated Militia of Upper Canada persevered and helped to make this year's Battle of Crysler's Farm another success. With Upper Canada Village as a backdrop, one certainly could get into the feeling of being early 19th century Canada! Crysler's1813 logo c/o Amanda Fasken. of the Grenville Militia! It isn't every day that you get to set up camp on an actual National Historic Battlefield site. 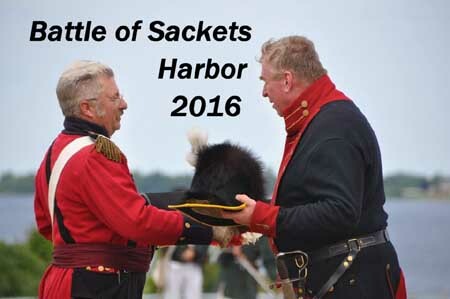 Each year we are invited by Connie Barone to attend the Battle of Sackets Harbor in Sackets Harbor New York - just east of Watertown. This year included four 1812 gunboats and their crews! A new addition, the 4th Regiment of Foot, fielded 5 additional redcoats this year. Great site, Great people, Great public interaction! They seemed particularly impressed when it looked like we were losing! Watertown Daily Times also has a link to some great pictures.